Gili Trawangan Island is the largest, busiest as well as furthest from the main island of Lombok. Trawangan is also the only Gili which has significant height above sea level. With a length of 3 km and wide of 2 km, population of Trawangan is about 800 people. Actualy, Trawangan has the various facilities for tourists. Shop "Tir Na Nog" claim that Trawangan is the smallest Island in the world that that has Irish’s bar. The most densely populated part of this Island is east of the island. 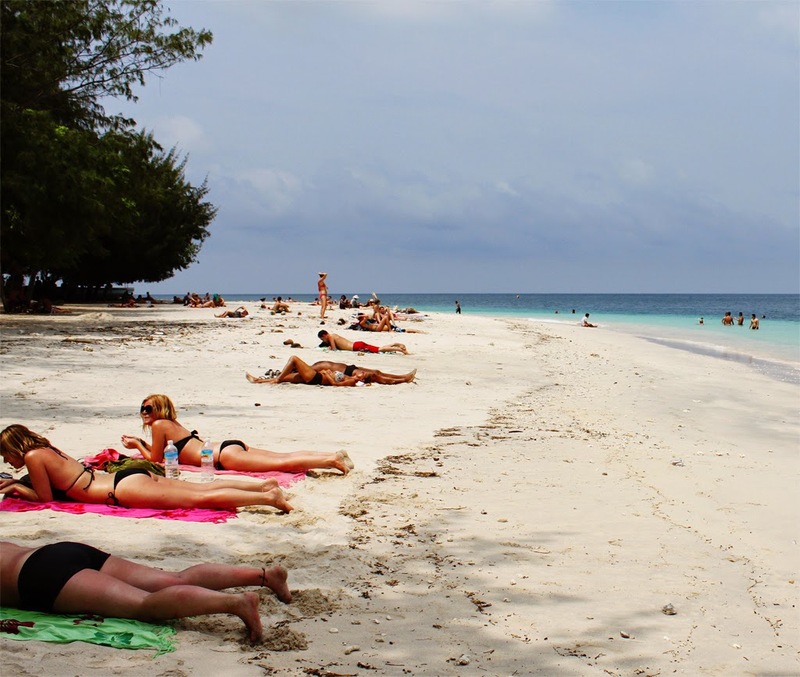 Most tourists who visit this paradise island Trawangan consist of people who are young and energetic. On holiday season, most of the night held a frenetic party with the music. Of course, if you want to get entertainment by doing night party, this place is suitable for you. You also can spend your honeymoon by enjoying the party. If you just want to feel the atmosphere of the beach without going to get wet, you can relax on the porch of the hotel, cafes, and restaurants. They are arranged beautifully so you can fell comfort and enjoy your holiday as long as posible. In fact, if you are interested to hire a horse-drawn carriage or cidomo or you also can hire a bicycle so you can go to surround the entire island of Gili Trawangan. Here, there is no pollution so there are no motorized vehicles and it is not allowed by local rules. To travel to and from Gili Trawangan, Gili Meno, and Gili Air, people of each resident usually use motorized boats and speedboats. Diving is a main purpose of most tourists that come to Gili Trawangan, by diving, you can seed amazing underwater experience. Do not worry if you are beginner to dive because the team will guide you. In the underwater, you can do snorkeling with turtle, see beautiful fishes and manta rays. It will be valuable experience for you, won’t you? Of course, invite your beloved someone to come this awesome phenomena. If you want to make a holiday in Gili Trawangan Island, you can choose various hotels such as Villa Ombak Hotel, Ombak Sunset Hotel, The Trawangan Resort, Villa Almarik Resort, Villa Julius, Tir Na Nog Hotel, Villa Grasia resort and Spa, Desa Dunia Beda, and Villa Queen. Every hotel has different concept and characteristic so you will be free to determine which one the best hotel for you. Traditional until modern hotels will be found there. If you like traditional, you can choose hotel that provide traditional concept and vice versa. Some of valuable hotels have provided great facilities such as spa, water sport, swimming pool, sunset view, private beach, relaxing garden, restaurant, etc. The facilities offered also will determine the cost of certain hotel. Basically, you can make order to book certain hotel by utilizing online service. By using your internet access, you can determine which one hotel that will be booked.